Streetwear is meant to be a forum for the majority, a great democracy that reflects the cultural climate and is fashion at its easiest access level. Its purpose is to circulate and to disseminate, adopted traditionally by high fashion brands opting to diffuse their ethos into a format fit for the general public. The streetwear market perpetuates along a common denominator, bringing all of a brand's pop culture references and ethics along with it. 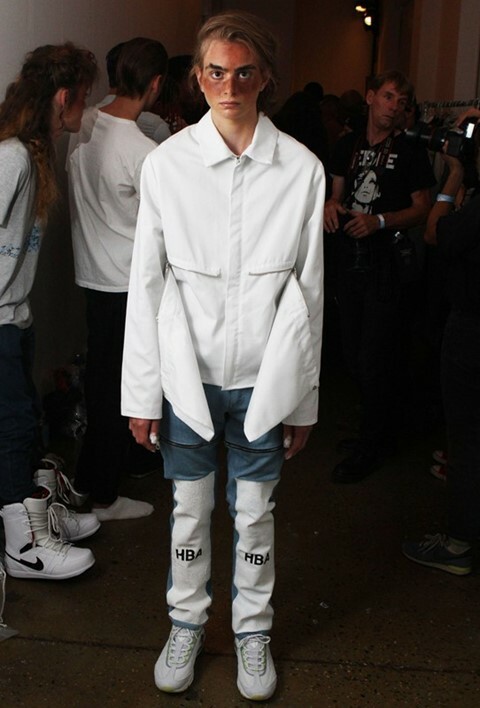 In their recent SS14 show, Hood By Air, a streetwear favourite of performers like A$AP Rocky, Kanye West and Rihanna, collaborated again with perennial muse and performance artist boychild. The day before hitting the runway for HBA, boychild did an androgynous, expressionist drag performance to a packed audience at the Suzanne Geiss gallery in Manhattan, lip synching to remixed pop favorites (including Rihanna's heartfelt "Stay") and creating an emotional energy that was beyond categorical. Androgyny, in this case, does not mean embracing both genders but denying them; creating a neutral space in which to present and connect at a deeper level. It is humanising and equalising. Perhaps that is why Hood By Air finds so much inspiration in boychild. As a label it uses streetwear codes to explore a range of progressive high fashion concepts, such as genderless styling and subversive branding, to appeal on a human level. A lack of concern in gender politics has allowed HBA to imagine a massive redefinition of popular dress, blending experimental identity with the viral energy of streetwear. By denying us the opportunity to assign gender to their work, HBA is flipping the role of streetwear on its head: no longer reflecting the majority, but informing it.